Should I write two pages targeting two phrases? Or write one page targeting both? Does Google consider these to be two separate topics? This is a key question when researching blog keyphrases, but also for our sales-focused product and services pages. Keyword targeting is critical to both kinds of pages and visitors we all have on our websites. To find the answer, search for both phrases and look closely at results. Is there a lot of overlap? Here’s an example of two search results pages for two separate phrases. In this example, you can see that the two share many of the same results. This is strong evidence that they are really the same topic. One page can target both phrases. Another clue: look for the bolded text within search results when you search. 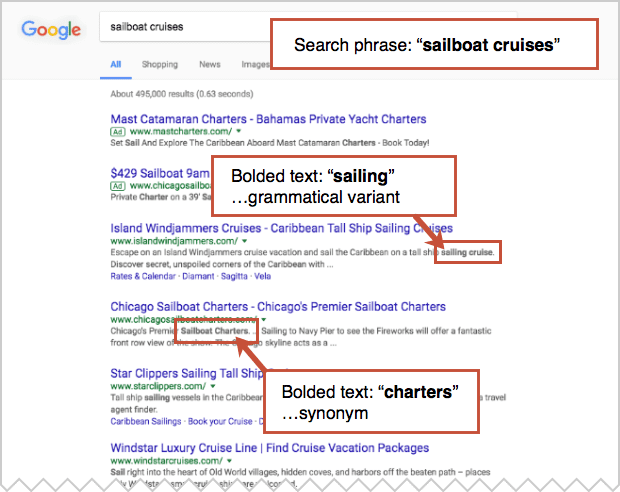 Google bolds the phrase that you search for, making search results easier to scan. But they also bold closely related grammatical forms and synonyms. When you see words from your two possible phrases bolded in the search results for either, they are really the same topic. One page can target both phrases. If there is a lot of overlap in the search results, the two keyphrases are really one topic. Write one page that uses both phrases. If there is very little overlap in search results, the two phrases are two separate topics. Write two pages and target each phrase separately. Confirm that you have sufficient Domain Authority to rank for the target phrase(s). Create the best page on the internet for your topic. Indicate relevance using basic SEO best practices. How does Google decide if it’s one topic or two? Google assumes that the search results are relevant if a person searches for a phrase, sees the results, clicks through to a website and stays on that site without clicking back to the search results right away. Google assumes that the search results are not relevant if a person searches for a phrase, doesn’t click on any of the results and immediately searches for another phrase. In this case, Google will offer up different search results based on the new keyphrase. So the question “is this two separate topics?” is really based on the signals sent to Google by past searchers. Google is listening to what we all do in all the search results. Make sense? Here are questions our clients and friends often ask us about keyphrase targeting, multiple phrases and multiple pages. 1. How can I target two phrases on one page? The key is to write about the topic, not just a specific phrase. When you cover a topic more broadly, you’re naturally targeting many of the phrases related to that topic. 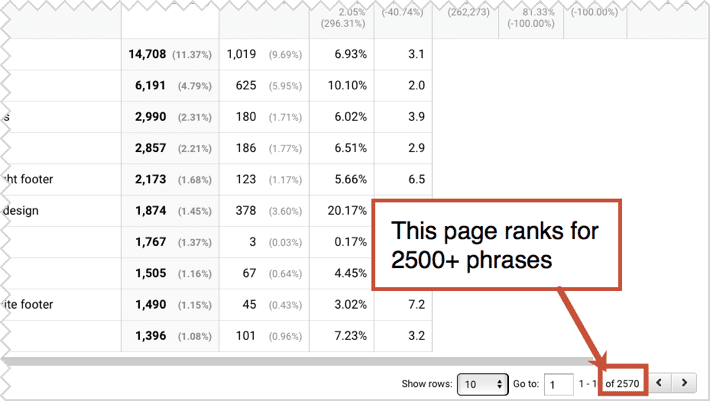 If successful, the page will rank for many phrases, all related to your topic. Here’s a screenshot of the Analytics for another post on this blog. You can see that this one page ranks for thousands of phrases. It’s very common. Wonder what your page is ranking for? Here’s how to find out: What Do I Rank For? 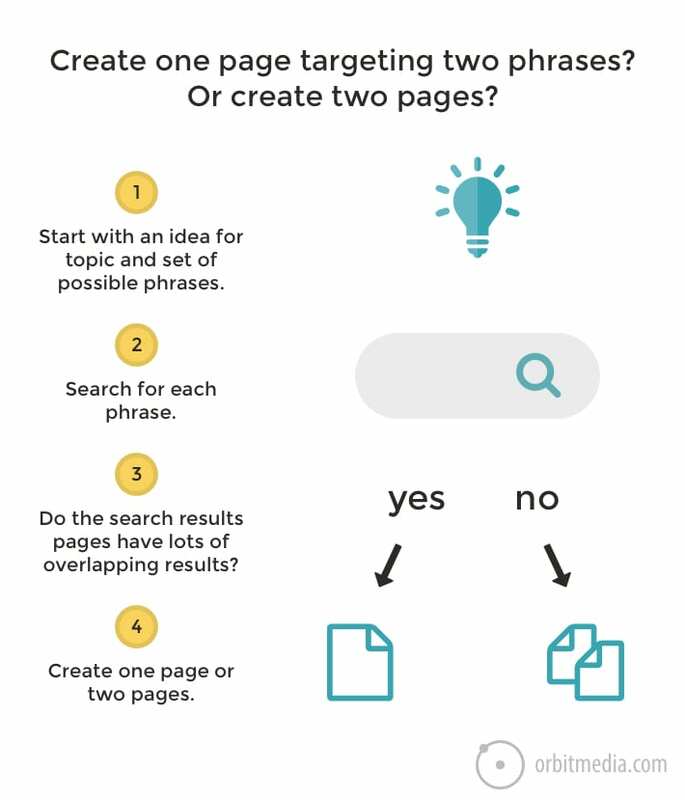 To target a topic (and multiple phrases) use the step-by-step instructions we’ve written about for semantic SEO. This is super important for modern day SEO. But in the end, you’ll still need to choose a primary phrase for your title tag, meta description and headline. Sometimes, you can work a secondary phrase into those same places. We’ve shared tips for incorporating secondary keyphrases on Bruce Clay’s website. 2. My page already ranks for keyphrase X. But I want a different page to rank for that phrase. Can I get another page on my site to rank instead? This is difficult. You’re already ranking because Google sees that URL as relevant for the phrase. If a URL already ranks for a phrase, don’t try to change Google’s mind. If you want those visitors to go to a different page, promote the second page using internal links. 3. My page is really about topic X, but can I get it to rank for topic Y? That would be a betrayal of the visitors intent. That’s spam. This is the opposite of what visitors want and what Google wants. If you’re asking this question, you’re on the wrong track. And now you know if that target keyphrase indicates one topic or two. Once you’ve decided what you’re writing about, go make the best page on the internet for that topic. Great post, Andy. This comes up a lot for me and it’s easy to over-complicate it. This is a really straightforward method for answering these types of questions. Do I already have a good page to rank for this term? The simple way to answer that question is with a google search for “site:yourdomain.com keyphrase” and let google tell you which page they see as the most relevant to that term. From there you can manually check where that page ranks, then determine if it just needs some SEO love or a brand new page. control + f to find the phrase on the page. Count the instances of the phrase in body text (links don’t count). Then compare it to the high ranking pages. It’s an oversimplification of SEO to just count phrases, of course. But a lot of people forget the most basic ways to indicate relevance. Control + f is a great SEO “tool” that I use all the time. Nice! I recently came accross this a lot. I was just about to write for a friend’s site (techhelp.ca) since he was on holidays and the two keyowrds were very much the same. With your tips and other commenters here, I just searched Google for both and boom, one was more relevant in Google’s eyes. Nice post and thanks. Great article Andy and a good point you brand up. I face this every time i begin to write an article haha. 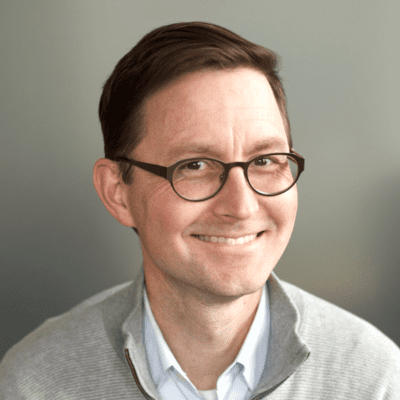 I like the approach by Zack mentioned where he uses Google search “site:yourdomain.com keyphrase” I have used that before and was surprised that i already had a page that i could slightly optimize to rank for the new term i was going for. I am most interested in actual tools. Obviously, I start my research (usually involves competition, hehe..) via Google. That’s the start point. I then use “third party” tools like WebAnalysis (http://webanalysis.tools/) and SimilarWeb (https://www.similarweb.com/), and they are good for this sort of work. The former more for “manual” analysis, the latter gives some “insights” on its own. But when I have twelve pages to optimize – ten keyword variations for each – that’s a touch time consuming. 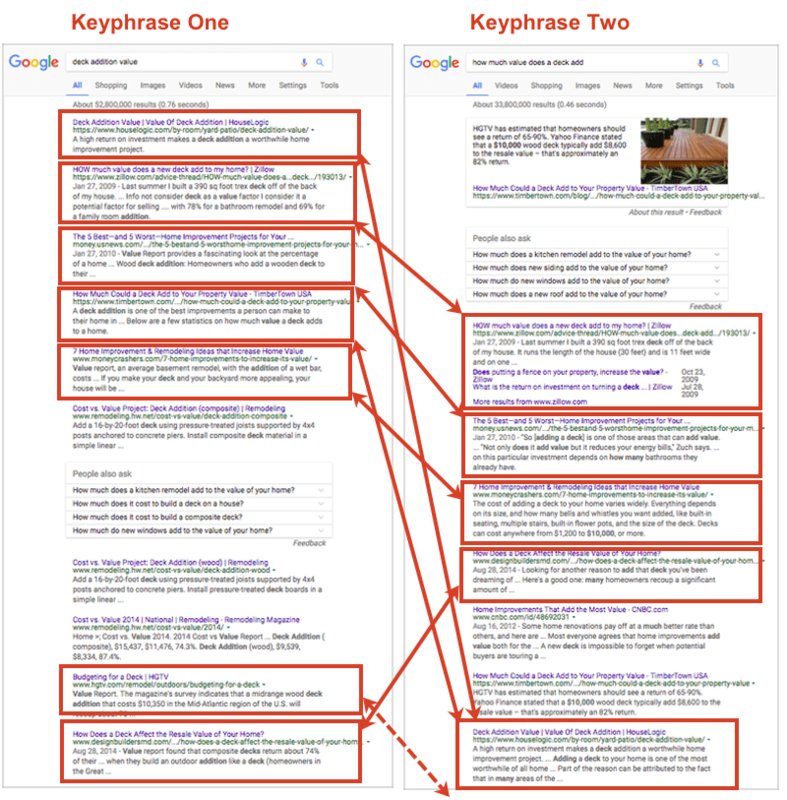 Andy, that’s a good article… often we focus more on keywords and less on “adding vakue” to content..I think if we follow the latter, keywords phrases (as you mentioned) will most likely be included.